Yong Guan is a point in the plant of our feet, by which we connect with the Qi (energy) Earth and, therethrough, with other beings that inhabit this planet. Are the lips to kiss our feet while walking land. Yong Chinese translates as "jet" and Quan, "source". Yong Quan could translate as "bubbling well", "Fuente emerging" o "manantial". It is also noted as the place where the water emerges from the ground, as the kidney meridian terminal. This spring, point of connection to the Earth Qi, is located in the center of the soles of our feet, near the base of the thumb, about a third of the distance between the toe and heel of our foot. In practice Qigong and Tai Chi, this point or place for which we connect deeply with the Earth is of great importance. Starting from the position wu chi we connect with the earth imagining that the soles of our feet send roots, feeling trees, that penetrate the earth to its deepest core, Nadir, from which we receive energy and stability. If our sensitivity connection with power is developed, we feel, when standing in stance wu chi or walking in a conscious, in walking meditation, how from the bottom of our feet bubbles that chi or vital energy, from land, ascends through our legs, on its inner side, hasta el Dan Tian, fundamental center of energy in the lower abdomen. 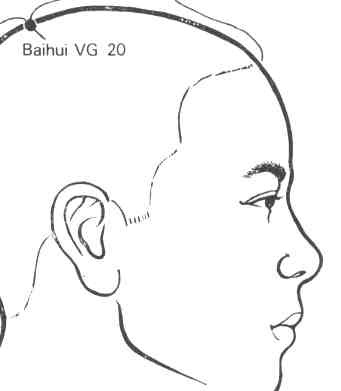 It, Once connected to the earth, we open our connection to heaven, through the door Baihui, the highest point of our head, Qi descend from Heaven, as a rush of energy, to our dan tian, thus effecting the encounter with the Earth Qi. We become that synthesis and fusion connection between Heaven and Earth. As acupoint, is activated to provide calm and serenity to the spirit and headaches down. It's like channel excess energy down, Quan Yong giving status grounded. 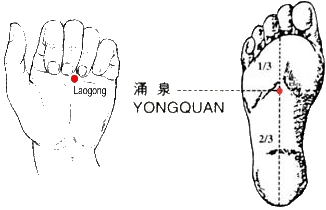 How to apply acupressure to Yong Quan? Sit in a straight chair, up the ankle of the left leg above the knee or thigh of the right leg. Hold your left foot with your right hand (with both the), while the right thumb massages the yong quan. Do this for 2 the 3 minutes, and change of foot. In the same position, with his foot on the knee, apply the palm of the opposite hand on the sole of the foot, to coincide with the Yong Quan Lao Gong. Do this for 2 the 3 minutes, and change of foot and hand. This exercise activates the kidney-heart axis: connection between the energy of Water (Can) and energy of Fire (Li).